EDC: LOL, BQX Not DOA, OK? Even after the city named 21st Street a "Vision Zero priority corridor," the mayor is still pushing for a trolley. Sorry, Queens activists: The BQX trolley ain’t dead yet. Several street safety leaders in the largest borough were crowing last week when the mayor named 21st Street as a “Vision Zero priority corridor” — believing that the roadway’s inclusion in a crucial street safety program would make it impossible for the Economic Development Corporation to pursue its plans for an at-grade streetcar along the same roadway. But city officials said the BQX is still a go. She added that the agency expects to begin working on the Environmental Impact Statement this spring. That countered some activists’ belief that the BQX was incompatible with the city’s pedestrian safety efforts. Morris was clearly hoping that the installation of safety measures, which include pedestrian head-starts at intersections, signal re-timing to slow down drivers, speed bumps and cushions, stepped-up enforcement, a possible bike lane and other engineering improvements, would block the BQX, also known as the Brooklyn-Queens Connector. A spokesman for the Department of Transportation, echoed the EDC’s commitment to the BQX, adding that safety and the BQX could go hand-in-hand. It is not clear if Gastel is right. Very few academic studies have been done about the safety of at-grade trolley systems or trams. The ones that have been done have raised some red flags. Safety improvements are certainly crucial along 21st Street, as both DOT and Transportation Alternatives have concluded. According to city statistics, the 3.6-mile corridor had an average of 4.2 pedestrians killed or seriously injured per year between 2012-2016, up 50 percent from 2.8 pedestrians killed or seriously injured between 2009-2013. Overall, last year, there were 94 reported crashes along 21st Street between 20th Avenue and the Queensboro Bridge, with nine cyclists and 23 pedestrians injured. From 2012-2018, there were 528 reported crashes, killing three pedestrians, and injuring 54 cyclists and 179 pedestrians. Regardless of its potentially positive impact on safety, the BQX remains a hugely controversial venture from the de Blasio administration. Its price tag alone — $2.7 billion to build — raises eyebrows among city planners. And many trolleygaggers have pointed out that a dedicated bus route — also known as bus rapid transit — could accomplish much of the same goals with less construction costs. The BQX would make its Astoria-to-Gowanus run on city streets with very little, if any, dedicated lanes, putting it in traffic with cars. Last year, the city cut Sunset Park out of the route. And the mayor originally said the streetcar would pay for itself in the form of higher property values along its route — but City Hall has now said about $1.4 billion would be generated for the trolley. MAYBE YOU WANT A BIKE-TRAIN? If y’all want to oppose this project on the grounds that it’s a misuse of scarce transit funding when there are more pressing needs, or that it essentially amounts to a taxpayer-funded “amenity” to increase the value of new luxury developments, fine. But to oppose it on safety grounds is kind of absurd. Seriously. I’ve never seen BQX attacked for any reason that is both valid and applies specifically to BQX. Except maybe one, and even it’s not quite specific. : for the cost you should be able to get a subway. Otherwise it’s a good transit route, and probably a good multimodal transit corridor that should have several routes including subways and surface rail. If you’re going to make a safety critique of BQX, you should probably consider local conditions and practices. Not sure how it translates into accident incidents off the top of my head, but some of New York’s surface transit procedures are pretty atrociously backwards, and should probably just be dropped whether the mode is bus or tram. One of the most obvious is buses leave the traffic flow to stop; best practice is traffic behind the bus should stop – and even better, mostly other vehicles should not be allowed to go around the bus. New York also has a lot of angular bus routes. This might be harder to overcome, and trams are probably safer making turns, considering they have a fixed guideway. BQX, brought to you by the people who couldn’t get a garage and park built in 15 years. Philly does this. It’s pretty sweet. The timeline for the project has also changed, the source said: BQX boosters hoped construction would begin next year, it's now slated to start in 2024. There is a far better, far cheaper alternative to the streetcar: Bus Rapid Transit. It is still unclear if this $2.73-billion thing is really going to happen. 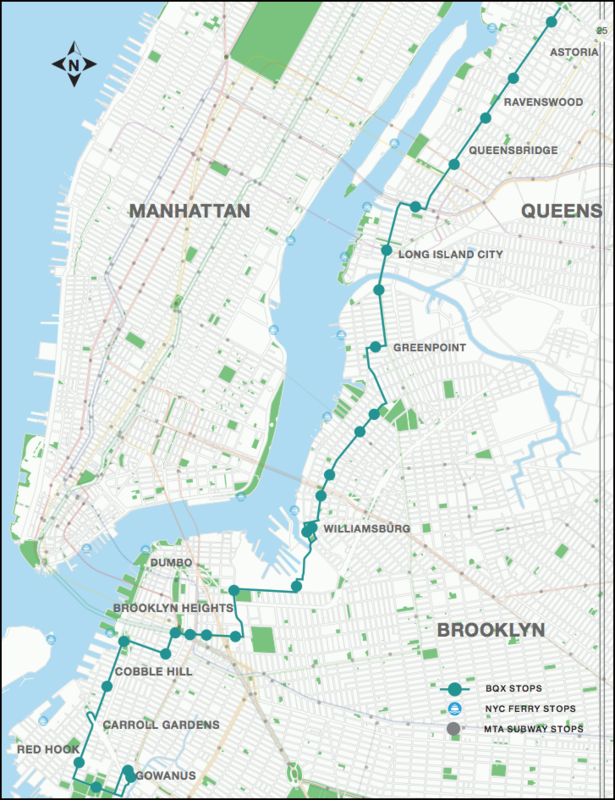 New Yorkers will be fine without a Brooklyn-Queens waterfront streetcar. But without a useful bus system, the city's in trouble. On WNYC, the mayor talked about ferries and the streetcar as transit solutions for the city's growing population, never mentioning the bus routes that are hemorrhaging riders.